Most ceiling fans even help in the winter when operated in the reverse direction by forcing warm air near the ceiling down into your occupied area. Ceiling fan/light combo kits that have earned the ENERGY STAR® label are about 60% more efficient than conventional fan/light units. Performance-grade fans are designed for continuous, quiet operation. They use larger, more powerful motors, and are generally the most expensive models. Medium-grade models are designed to operate 12 hours or fewer per day, and economy models are designed to operate 8 hours or fewer per day. You will have to do some research to determine fan grades. Check manufacturer’s websites for information. Three-speed motors are recommended for maximum comfort. Most fans (and all ENERGY STAR-qualified models) can reverse direction via a switch on the housing, so that they can move warm air (which rises up to the ceiling) down into the room during the winter. Blades should be sealed or finished to prevent moisture-caused damage such as warping, peeling, or tarnishing, especially if the fan will be used in a high-humidity situation. More blades do not necessarily move more air. The pitch (angle of the fan’s blades), balance of the blades, length of the blades, motor design, motor speed, number of blades, etc., are all important in determining how much air a fan can move. Figure 2. Sample ENERGY STAR logo for use on qualified products only. Credit: Courtesy of ENERGY STAR. Figure 3. Sample ENERGY STAR® Most Efficient logo for use on qualified products only. Credit: Courtesy of ENERGY STAR. Note that the Environmental Protection Agency (EPA) has a designation ENERGY STAR Most Efficient 2015 (Figure 3). This label recognizes products that deliver cutting-edge energy efficiency along with the latest in technological innovation. The year included on the label designates that the device/appliance meets the criteria for the year indicated. 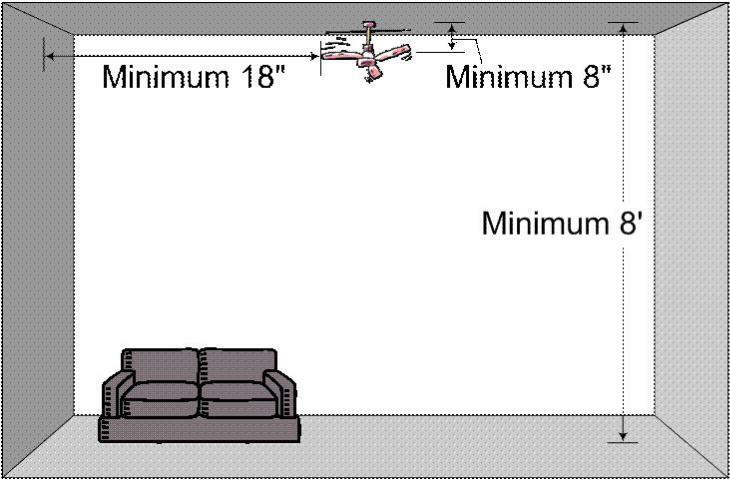 Ceiling fans are one of several appliances/devices that have units meeting these criteria. If interested, begin your search at ENERGYSTAR’s Most Efficient 2015 web page. If you’re installing a fan in a bathroom or other humid location, make sure it is UL-listed with a “damp” rating. If you are mounting a fan where it may come into direct contact with water (e.g., a porch or patio), be sure it has a UL “wet” rating. These fans have features such as sealed or moisture-resistant motors, rust-resistant housings, stainless steel hardware, and all-weather blades (See “Wet/Damp Rating,” ENERGY STAR Ceiling Fan Basics). What are the current ENERGY STAR ceiling-fan specifications? Ceiling Fans Specification defines residential ceiling-fan airflow efficiency on a performance basis: CFM of airflow per watt of power consumed by the motor and controls. Efficiency is measured on each of 3 speeds. Qualifying ceiling-fan models must come with a minimum 30-year motor warranty; one-year component(s) warranty; and a 2-year light kits warranty. Integral or attachable lighting, including separately sold ceiling-fan light kits, must meet certain requirements of the Residential Light-Fixtures (RLF) specification. See the Qualified Product Information (QPI) form for specific requirements. To help you evaluate different ceiling fans with lighting for purchase, go to ENERGY STAR Fans for Consumers and click on the Savings Calculator. American Lighting Association. (n.d.). Selecting a ceiling fan. Retrieved May 6, 2015. ENERGY STAR. (n.d.a). Ceiling fan basics. Retrieved May 6, 2015. ENERGY STAR. (n.d.b). Ceiling Fans for Consumers. Retrieved May 6, 2015. Lawrence Berkeley National Laboratory, Energy Efficiency Standards Group, Energy Analysis & Environmental Impacts Division / U.S. Department of Energy (n.d.) Residential: Ceiling Fans. Retrieved May 6, 2015. U.S. Department of Energy Energy Saver (n.d.). Fans for cooling. Retrieved May 6, 2015. This document is FCS3261, one of an Energy Efficient Homes series of the Department of Family, Youth and Community Sciences, Florida Cooperative Extension Service, Institute of Food and Agricultural Sciences, University of Florida. This material was initially prepared in June 2008 with the support of the Department of Environmental Protection, Florida Energy Office, which is now the Office of Energy, Florida Department of Agriculture and Consumer Services. This revised version was prepared May 2012 with the support of the Florida Energy Systems Consortium (FESC) and updated May 2015. Any opinions, findings, conclusions, or recommendations expressed herein are those of the author(s) and do not necessarily reflect the views of the sponsoring organizations. Visit the EDIS website. Hyun-Jeong Lee, former assistant professor, Department of Family, Youth and Community Sciences; Kathleen C. Ruppert, Extension scientist, Program for Resource Efficient Communities; Wendell A. Porter, lecturer and P.E., Department of Agricultural and Biological Engineering; and Randall A. Cantrell, Assistant Professor, Department of Family, Youth and Community Sciences, Florida Cooperative Extension Service, Institute of Food and Agricultural Sciences, University of Florida, Gainesville, FL 32611.